"...young Soraya Mafi lights up the stage and pricks up the ears "
In 2019, Soraya will make her début with Opera National du Rhin, Opera Nancy and Opera Versailles as Cintia in Legrenzi's 'La Divisione del Mondo' with Christophe Rousset. She makes major role débuts as Gretel Hansel und Gretel (Grange Park Opera) and Gilda Rigoletto (Seattle Opera). She will also return to English National Opera is Love in Gluck's Orfeo and Yum-Yum in The Mikado. In 2020, Soraya returns to Welsh National Opera to make her role début as Susanna Le Nozze Di Figaro. 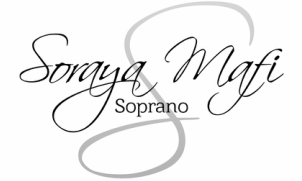 Soraya has been nominated for Young Singer of the Year at The International Opera Awards. Winner to be announced on 29th April at Sadler's Wells.